Take a look at this adorable purse. 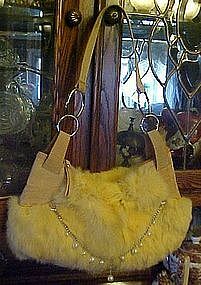 Made of rabbit fur with faux suede sides and handle. Lined and has lots of nice storage compartments with zippered top. Chain swag on the front with pearl accents . Gently used but in like new condition. Purse is 7 1/2" x 13" wide plus the handle. An adorable purse!